This is Kinderkijk, which is also pictured in the "banner" at the top of this page. 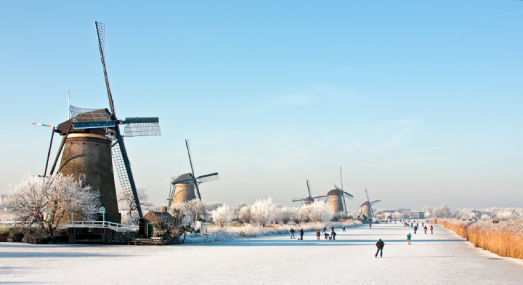 We often get the question "Do the Dutch still skate on the canals?" Here's the proof of the answer: "Yes, when possible." We have had a pretty cold winter, making this shot possible. If you don't mind wrestling your way through a bit of Dutch, here is a link that will take you to the pictures of Children's Camp 2015 as they appear on our Dutch Site for the camp. There is one Album that is password protected, you will have to e-mail me if you would like to see those Close Ups. Click here. You have read about our Market Place Evangelism. The "season" for this ended at the end of September. Here are some pictures of our stand and our people engaging passers-by in conversation. Please notice the video towards the end of this Album. Feel free to download it and show it in church.